From the time I started IMMORTAL OUTLAW, I intended to take you all on a tour of the locations in the book and reveal the fact and fiction in the story. However, I didn’t want to post too much too soon and end up with spoilers. Well, why not? It’s a story that has been around for at least 600 years, so it clearly resonates: A good man outlawed for either an unfortunate mistake (accidentally killing a forester) or for standing up to tyranny (refusing to do homage to a usurper trying to steal the throne) depending on the version you’re reading, making his way in the wilds, gathering a band of like-minded men around him to redress the wrongs of society by robbing only the rich to aid the poorest around them. Bows and arrows, horses, great chase scenes through the woods, comic relief, and a love for the ages. Great stuff, even if it’s likely based on the romanticized story of a tax-evading scofflaw. I watched TARH in syndicated re-runs, and I loved it from the first. 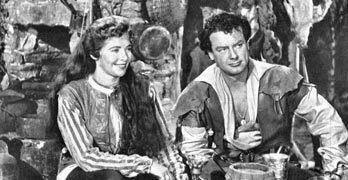 I fantasized about being Marian, who in the series was brave and bold and every bit as good with a bow as Robin. No victimized Olivia de Haviland here. She was a tough cookie (and even tougher after pixie-like Driscoll took over), and she fought the bad guys alongside the men. This was probably because the producer was Hannah Weinstein, one tough cookie herself (she hired blacklisted writers like Ring Lardner to write episodes under psuedonyms, which explains the solid, socially conscious storylines). As a bonus, bits of the series were shot on location in the meadow at Runnymede where the English barons—including a descendant of the real Ivo from Immortal Warrior—forced King John to sign the Magna Carta. The production values on TARH were pretty high for the time (it was shot on 35 mm film), so even now, some 50+ years later, the images are crisp. You can find the DVDs at Amazon (all four seasons/143 episodes for under $25). So, yeah, Robin Hood, and not for the first time. My first published romance, Hostage Heart, was totally Robin Hood gone cowboy, a straightforward western version of the legend complete with robber-cattle-barons and unsavory sheriffs—unlike this one, which is my fantasy about how such a story might have come about if our boy Ari had been around. I hope you’ll follow along as we retrace Steinarr and Marian’s zig-zag route through Nottinghamshire. You’ll be able to see their path on the interactive map available from my Extras page or at GoogleMaps. Invite a few friends to come along. It’s going to be an interesting ride. So, what was your favorite version of Robin Hood (book, movie, or tv)? Did you ever dream of going outlaw for the sake of justice? Were you a fan of Little John, Alan-a-Dale, or Will Scarlet?